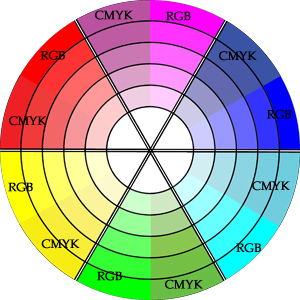 The purpose of this chart is to provide a resource where there is no color picker for the CMYK color space. The colors in this chart are in both the CMYK and RGB color space. The colors as shown were created by using the RGB color values typed in the box, then converting to CMYK, then back to RGB. It does not show the current RGB values, only the values as they were before conversion to CMYK. The purpose is to show the color shift and make it possible to predict the printed color when using "web safe" rgb values. Save the image locally and use it as a color source or print it on a color printer so you can see how your colors will actually print. It doesn't contain anything like all available colors, but it should help you stay inside the CMYK color space. 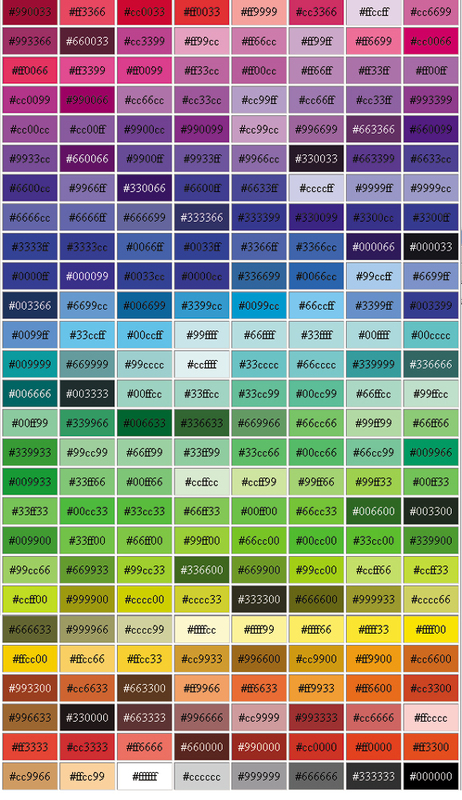 If you have a color picker I like the color picker chart better. What I did was first create a chart using "web safe" RGB colors. Those are the values in each box. Then I converted the chart to CYMK color. The result was saved as JPG (maximum). You can get an idea of the color difference by comparing RGB colors created using those values against what is in the chart. There is no comparision here on purpose. It is much easier to select CMYK colors when you see them compared only against themselves. While CMYK doesn't look as bright as RGB it has great colors in the context of CMYK. Ok - take note - when I started I thought that web safe and print safe were the same thing. They aren't. Web safe is a concept that has no meaning in the print world. Some web safe colors will shift, and some won't. Compare what is in this chart - which are the shifted colors, to what the RGB colors look like when you first create them using the values in each square. An alternate chart made in a similar way is the CMYK color picker. Experiment, click around, I think that is the best way to "get it." This chart has "web safe" RGB colors that are shared with CMYK so that you shouldn't notice any color shift if you use these colors.